This $50K SUV needs more than muscle car looks to justify its price tag. 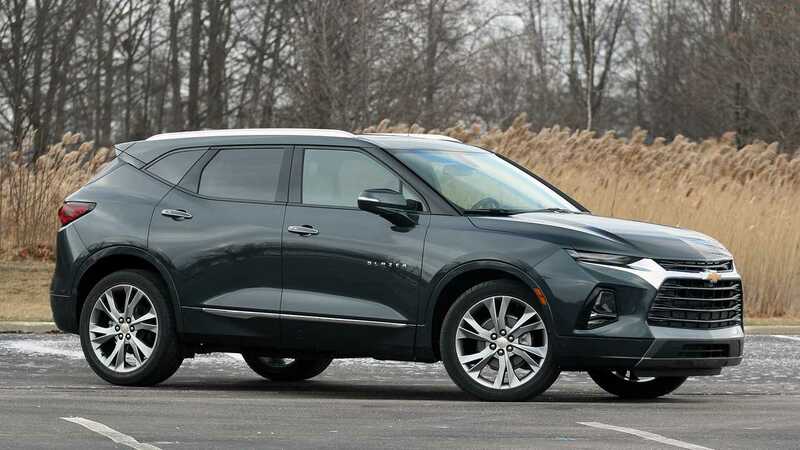 Considering America’s appetite for sport utility vehicles has shown no signs of satiation, the 2019 Chevrolet Blazer is a smart vehicle for the Bowtie brand to slot in between the compact Equinox and full-size Traverse SUVs. The addition gives Chevrolet a full lineup of car-based crossovers and tough SUVs to choose from, all the way from the tiny Trax to the super-sized Suburban. 2019 Chevrolet Blazer RS First Drive: Don’t Blaze Me, Bro! The 2019 Blazer has styling inspired by the legendary Camaro muscle car, a well-proven powertrain, and the right balance between a comfortable ride and confident handling going for it. Unfortunately, those positive attributes can’t overcome the Blazer’s high price and an overall impression that Chevrolet just didn’t try very hard with this one. Some argue its name is the problem: Blazer. The fact Chevy revived the name of a real SUV for this pavement-preferring soft-roader, though, doesn’t bother me. What bothers me is that the new Blazer feels like an opportunity almost, but not quite, realized. If you’re going to develop an SUV that looks inspired by the Camaro, why not make that connection more than merely aesthetic. Surely a Camaro Utility Vehicle should be more than this. For more on how Motor1.com rates cars, click here. The new Blazer is expensive – there’s no other way to put it. While its $28,800 base price is actually below average for the segment, the cost of this nearly loaded Blazer Premier comes in at an astonishingly high $49,290. The Premier is the Blazer’s top trim, with a base price of $43,895 for a front-wheel-drive version. Opting for all-wheel drive and the more powerful 3.6-liter V6 engine (a 2.5-liter four-cylinder is standard, but AWD requires the V6) raises the price to $46,795. On top of that, this test vehicle also has the Sun and Wheels package, which adds a panoramic sunroof and 21-inch wheels for another $2,495. One could also add the Driver Confidence II package for $2,165 that would push the final price over $50K, but the version I tested came without it. How expensive is $50K for a mid-size SUV? For one, it’s firmly within the territory of bonafide luxury SUVs from brands like Acura, Infiniti, Lincoln, and Cadillac. Second, it costs more than fully loaded versions of the Blazer’s competitors. A maxed-out 2019 Ford Edge Titanium AWD with more comfort and convenience features than this Blazer Premier AWD comes to $48,285. Even a fully loaded Ford Edge ST with more power and performance chops undercuts the price of the Blazer Premier AWD. The Blazer’s saving grace here might be that we expect Chevy dealers to offer plenty of financial incentives to get you to buy. No one will likely be paying these high MSRPs in reality. Styling is the Blazer’s strongest suit. The exterior is clearly inspired by the Bowtie brand’s legendary Camaro muscle car. It’s perceptibly shorter and wider than most SUVs, which further bolsters its muscle car persona. Of course, any pretense of being off-road capable is absent, but it’s refreshing to find an SUV that isn’t feigning those credentials. The interior, as well, owes credit to the Camaro, because most of it came straight from that car’s cockpit. The entire central stack of controls looks like it was lifted directly from the Camaro and installed in the Blazer, right down to the oversized air vents that twist to change the temperature. Unfortunately, though, a lot of the Camaro’s cabin’s foibles are ported over, as well. The tiny climate control buttons, the relatively low quality of the dash materials, and the extra-high beltline that imparts a slight sense of claustrophobia – all are perennial Camaro lowlights. Still, just like with the Camaro, those faults are fairly easy to overlook when you’re walking up to the Blazer in a parking lot. It looks cooler by a mile than the dozens of other SUVs parked near it, and that makes you a little cooler by extension, too. Comfort in the Blazer is average for the class. The ride is compliant and controlled, even with my tester’s extra-large, 21-inch wheels. Likewise, the seats are supportive but not too firm or constricting. And even with the Blazer’s relatively low roofline, headroom all around is on par with competitors, as is legroom in the second row. As a mid-size SUV without a third row, the Blazer’s cargo area feels quite substantial. At 64.2 cubic feet with the second row folded, the maximum size of its hold is similar to a Jeep Grand Cherokee but smaller than a Ford Edge. Even with the second row upright, though, there’s 30.5 cu-ft of space that should be large enough for most hauls. Chevy does include a clever cargo management system that features two tracks on which a metal barrier can slide. It’s a handy feature that allowed me to secure my groceries rather than letting them slide around in the back like they do in most SUVs. Chevy’s technology and connectivity games are on point across its entire lineup of vehicles, and the new Blazer is no exception. My tester features an eight-inch touchscreen with pinch-to-zoom, navigation, Apple CarPlay and Android Auto, and a 4G LTE WiFi hotspot (with a paid subscription plan). Out back, there’s also hands-free functionality for opening the hatch. On approach, a light beneath the bumper shines a Chevy logo on the ground, and when you kick your foot over the logo, the hatch opens. Some of the newest technology available today was absent from the Blazer I drove, but the aforementioned $2,165 Driver Confidence II package would’ve fixed that. It adds features like a wireless charging pad for smartphones, a 360-degree “Surround Vision” camera, and General Motors’ trick Rear Camera Mirror that can replace your rearview mirror’s reflection with a video feed of what’s behind you. All-wheel-drive Blazer’s come standard with a 3.6-liter V6 engine (front-wheel-drive models can be had a with a 2.5-liter inline four-cylinder engine). The V6 should be familiar to you if you’ve ever driven or ridden in any of General Motors’ Lambda-platform SUVs, which include the GMC Acadia, Buick Enclave, and Chevy Traverse. Versions of this engine are also in many other GM products, including the Blazer’s kindred spirit, the Camaro, and its Alpha-platform cousins, the Cadillac ATS and CTS. In this application, the Blazer’s 3.6-liter V6 produces 305 horsepower and 269 pound-feet of torque. That’s more power than most of its competitors (excluding performance models), and it’s routed through a high-tech nine-speed automatic transmission. The engine and transmission pair nicely and play friendly, though this engine isn’t powerful enough to cash the checks its Camaro-inspired body is writing. It’s not entirely the engine’s fault; the Blazer’s handling, steering, and braking are all tuned for daily comfort. There are a couple of annoying quibbles with the Blazer’s mechanicals. For one, the engine’s auto start/stop function cannot be turned off – a concession made for fuel efficiency, no doubt. Likewise, the Blazer’s all-wheel-drive system can be disconnected to save fuel. This has to be done manually via a cheap-feeling knob on the center console, whereas some competitors perform the same disconnect automatically when it makes the most sense to do so. While Chevy does offer the full gamut of today’s most advanced safety features on the Blazer, you’ll pay dearly to gain access to them. Features such as blind spot-monitoring, rear-cross-traffic alert, and rear parking sensors aren’t available on the base trim level at all and only become optional on the next trim level up. You’ll need to keep spending more until eventually, these three features become standard. It’s not until the expensive RS model (base price: $44,695), though, that more advanced features like a 360-degree “Surround Vision” camera, forward collision alert with automatic emergency braking, and adaptive cruise control become available as options, and they’re not standard even on the Blazer’s most expensive trim level. Considering it’s so new, it’s no surprise that neither of the big crash-testing organizations – the National Highway Traffic Safety Administration and the Insurance Institute for Highway Safety – have wrecked the Blazer yet. Chevy engineers did not include the ability to disable the Blazer’s automatic start/stop function, nor did they automate switching between front- and all-wheel drive. Both of these decisions were made to score the highest possible fuel economy rating from the Environmental Protection Agency. Despite those tricks, the Blazer only manages to rate a middling 18 miles per gallon in the city, 25 on the highway, and 21 combined. The turbocharged four-cylinder Ford Edge and V6-powered Nissan Murano both achieve 23 mpg combined. Even the Ford Edge ST, which is powered by a stronger V6 than the Blazer, is more fuel efficient. At least it doesn’t require premium in the tank; good-old 87-octane fuel is just fine.